On Wednesday, a team of scientists from around the world released the first ever directly-observed image of the event horizon of a black hole. 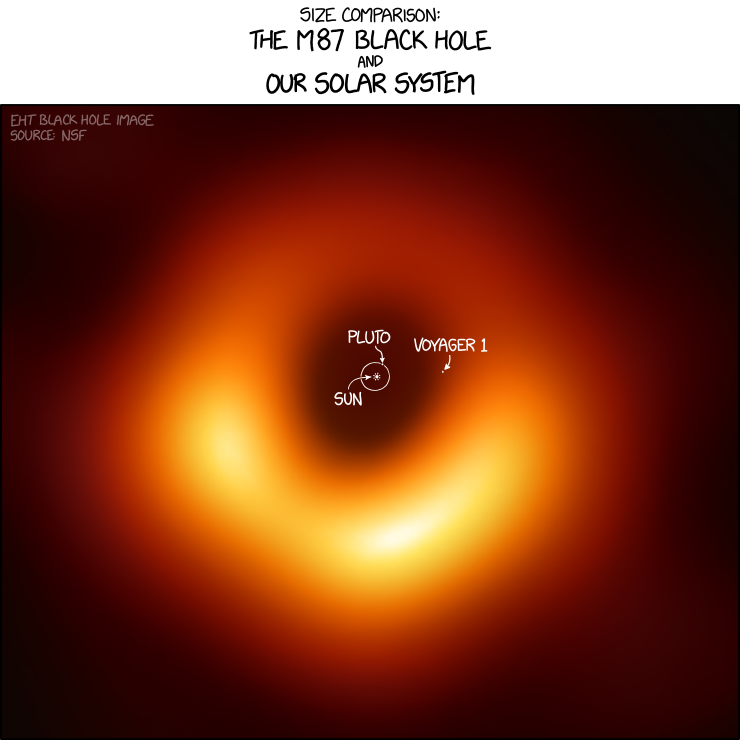 The black hole, M87*, is found within the constellation Virgo — and as the webcomic XKCD illustrated, it’s as big as our entire solar system. The gigantic black hole, not counting the giant rings of trapped light orbiting it, is about 23.6 billion miles (38 billion kilometers) across, according to Science News. Meanwhile, the Earth is just 7,917 miles in diameter — meaning our planet wouldn’t even be a drop in the bucket of the giant, black void. Based Futurism’s calculations, it would take just over 2.98 million Earths lined up in a row to span the length of M87*. For a sense of scale, that’s about how many adult giraffes it would take to span the diameter of Earth. Our entire solar system is just about 2.27 billion miles wide, meaning we could just barely fit the whole thing into the newly-imaged black hole’s event horizon. Thankfully, M87* is about 55 million light years away — so while we could readily fit inside its gaping maw, we’re way too far to get sucked in.